I cannot believe that it's not even officially winter yet and we've been hit with snow twice this week already! Snow that I was not expecting at all! Guess that's what happens when Disney Jr is on the tv all day! Facebook has been buzzing today with photos of the storm. Pretty pictures of snow-covered trees. Fun snap shots of the kiddos playing in the snow. Some not-so-fun photos of traffic jams caused by the snow. When I saw this picture posted by my friend Kristen, I just knew I had to share it with you today! How fun is this? Making milkshakes with snow! This is something Kristen learned from her dad when she was a kid and she was excited to share this fun snowy treat with her son! While Kristen didn't measure anything out, she did tell me she used snow, milk, sugar and a tiny amount of vanilla extract. But how yummy would it be to use peppermint or coconut extract? Or even some cocoa for a chocolaty snow shake? 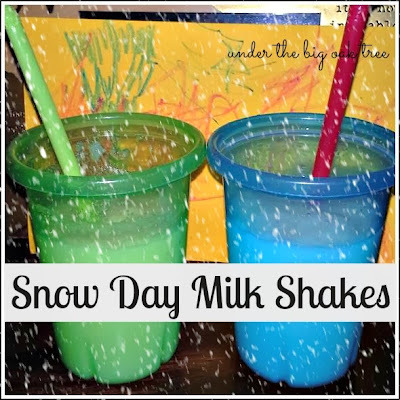 Looking online, I found recipes using 2-3 cups of milk to a blender full of snow, along with 1/2 cup of sugar. Another recipe even used sweetened condensed milk and skipped the sugar! And one calls for a shot of your favorite whiskey! Mmm! So maybe some coconut flavored rum instead of coconut extract? Really, you are only limited by your imagination and what's available in your pantry...and maybe the amount of clean snow you have on your lawn! Thanks for the inspiration, Kristen! I think I'll be having lots of fun with this idea this winter!